Encore by Extang Hard Folding Truck Bed Cover Featuring Both Front And Rear Truck Bed Access! Improve gas mileage by up to 10%, protect your cargo, and look good doing it! 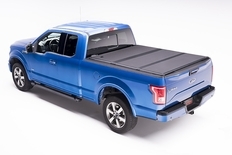 The Extang Encore Tonneau Cover puts other truck bed covers to shame. Why? 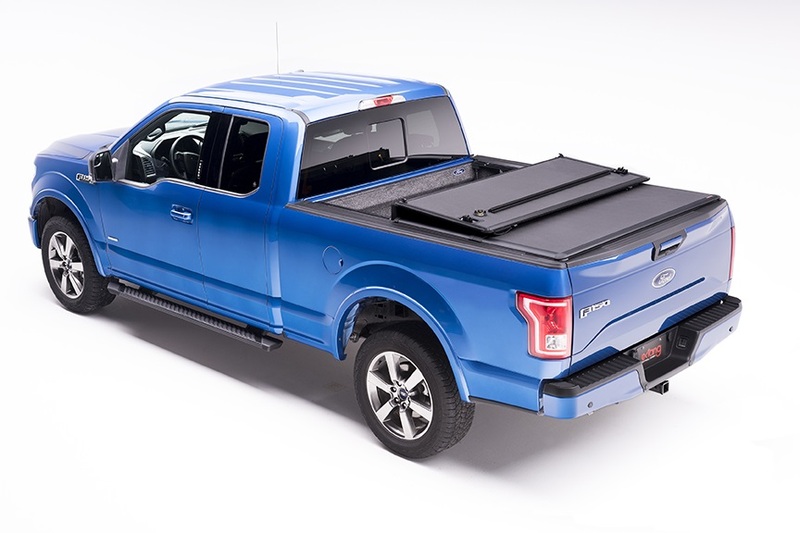 First, and foremost, this tonneau cover requires no automotive knowledge to install. Installation takes less than 30 minutes in your garage or driveway! Even more exciting are the Extang Encore's features! The Extang Encore Tonneau, like the Extang Solid Fold, is a solid cover, though it does have a lower profile than the Extang Solid Fold. 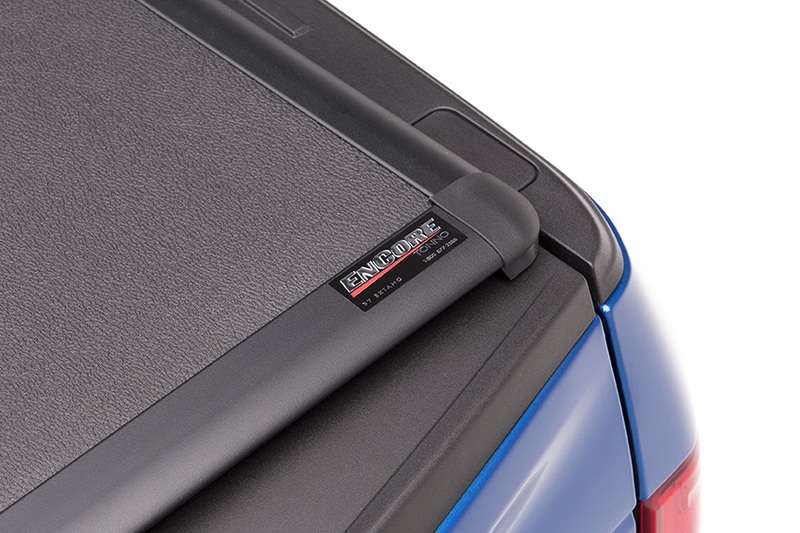 Unlike a soft tonneau, it offers great security and protection for your cargo. As long as you have a tailgate lock, your truck bed will be completely secure with the Extang Encore. The incorporated seals also protect your cargo from rain, snow and the other elements. The reinforced design makes this tonneau strong enough to stand or sit on. Versatility: The Extang Encore is a solid folding cover that can be either closed, or folded back exposing 1/3 or 2/3 of the truck bed. The front 1/3 features a locking mechanism for security and can be opened to access the front of the truck bed (see photos for an example of this). The Extang Encore Tonneau Cover is designed specifically to fit your truck make and model for a superior fit!. Trucks with spray on and under rail bed liners have nothing to worry about either! The Extang Encore still fits perfectly! If you have aluminum or stainless steel bed caps, you'll need to remove them in order to achieve a flat surface for closing your Solid Fold Bed Cover. The part number for this item is 62450 and it fits 2014-2017 Chevy Silverado, GMC Sierra 1500 and 2015-2017 Silverado / Sierra 2500 3500 (6 1/2' BED). 3 Year no hassle warranty. Install Time: Less than 30 minutes. Step 1. Unpack your cover and lay it out. Inspect for any damage to the cover and make sure all rails and clamps are present. Step 2. Place the Extang Encore rails along the top edge of the truck bed side wall. Rail should be one inch back from the cab rail shee tmetal edge. (Note: if truck has a bedliner, the distance will be smaller.) Rails must be installed level to ensure smooth operation and latch engagement. This may require moving the clamps up or down vertically on rail to achieve level position. Secure with clamps (see photos on printed instructions for further example). Step 3. (IF DESIRED) Drill a 3/4� hole through the truckbed knockout plug, truckbed or bedliner. Insert the included drain hose through that hole. Step 4. Stand the Extang Encore Cover on the drain rails so that the retaining hooks line up with the two pins inside the drain channel. Step 5. Unfold front joint and position cab and middle panels over truck bed, making sure retaining hooks engage pins in drain rail. Press down on cab panel to lock in place. Step 6. With tailgate open, unfold tail panel and press down onto truckbed. Tonneau should now be secured closed. Installation is now complete. Enjoy your new Extang Encore Truck Bed Cover! How to operate the front panel access and lock: To access storage at the front of your truckbed, turn the locking knob on the driver side of the cab panel. Be careful not to drop cab panel on center panel, it may mar panel surface. Always make sure the key is removed and the lock cylinder cover is closed when folding cover.